Want to do something special for your Valentine this year? Make dessert from scratch. We have 2 recipes that are not only easy to make, but also contain good-for-you chocolate: dark chocolate chips and cocoa powder. And our first recipe really does contain sea salt; that’s not a typo. Sweet & salty is an unexpected, but delicious combination. Using the Jenn Air Induction Cook Top makes melting the chocolate and marshmallows easy, and double boiler needed. 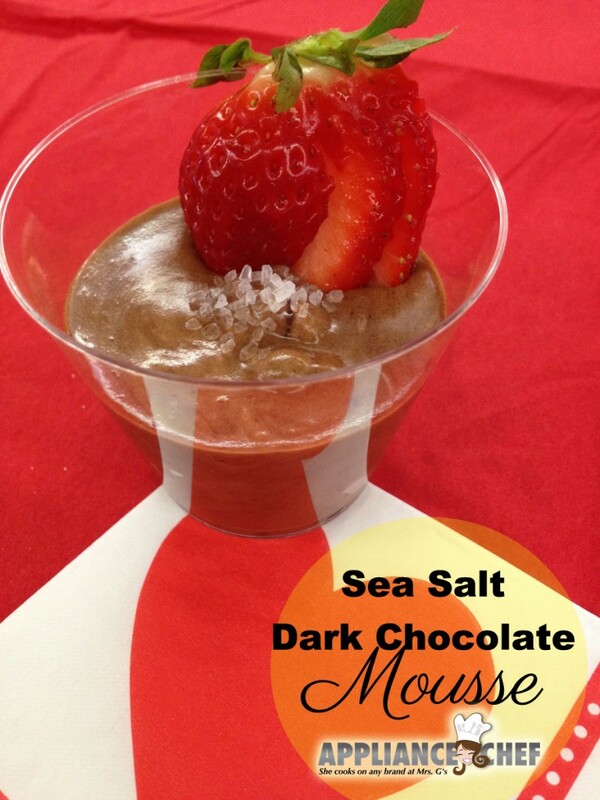 This is instant chocolate mousse. NO EGGS. The secret ingredient here is marshmallows. The marshmallows give this dessert a “soft squigyness” similar to the interior of a meringue and is the magical ingredient that turns this dessert into a chocolate mousse. This dessert can be made and ready to be served in less than an hour. *You can use any type of chocolate for this recipe; I recommend using good quality dark or bittersweet chocolate. 1. Place the mini marshmallows, soft butter, chocolate, sea salt and water in a heavy-bottomed saucepan, over low heat to melt everything; stirring every now and then until melted and combined. 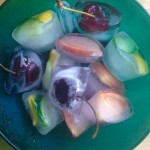 Remove from the heat and allow to cool. 2. Using your Kitchen Aid electric stand mixer (on speed 4 or 6), whip the heavy cream with the vanilla extract until thick and soft peaks have formed; for about 4-5 minutes. 3. 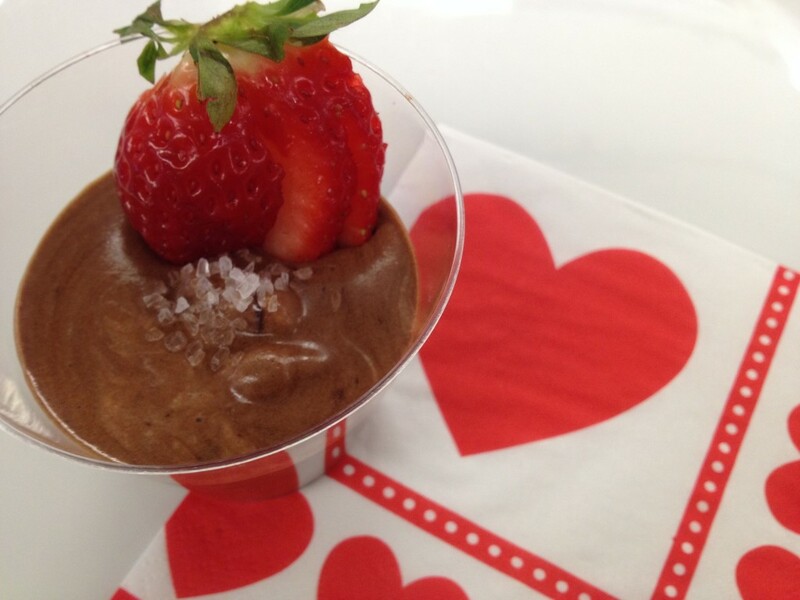 Fold into the cooling chocolate mixture until you have a smooth, cohesive mixture. 4. Place into 4 glasses or ramekins, and chill in the refrigerator until ready to serve. 5. I chilled mine for an hour but you could probably get away with only 20 or 30 minutes in the fridge. 6. Sprinkle on pink sea salt and enjoy! Cooking in the Jenn Air Double Wall Oven with V2™ Vertical Dual-Fan Convection System makes the perfect brownie for that special someone this Valentine’s Day. 1. Preheat oven to 350 degrees. Grease a 13 x 18 jelly roll pan with butter. 2. In large bowl, whisk together flour, sugar, cocoa powder, salt, and baking powder. Set aside. In a medium bowl, whisk together eggs, vegetable oil, 2 tablespoons milk, vanilla extract, red food coloring, and white vinegar. 3. 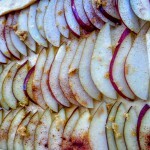 Combine the dry and wet ingredients, until completely combined. The batter will be a really thick, almost moldable texture...but don't worry, that's what you want. Remove 3/4 cup of the batter and place it in a medium bowl. 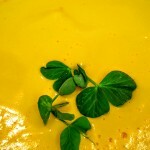 Whisk in the remaining 2 tablespoons of milk (into the 3/4 cup of batter you just took out). Set aside the 3/4 cup batter. 4. Pour the remaining batter into the prepared jelly roll pan. Using a spatula, smooth out the batter to reach all the edges. 5. Now, in your Kitcher Aid stand mixer, beat cream cheese and sugar until fluffy, about 2 minutes. Add eggs and vanilla, beating until combined and there are no lumps. 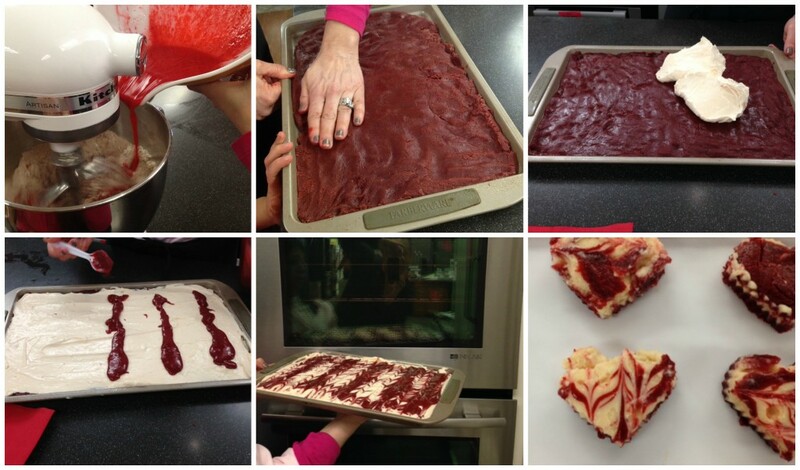 Pour the cream cheese mixture on top of the red velvet layer and smooth mixture till it reaches all the edges. 6. Drop spoonfuls of the remaining red velvet batter (that you mixed with milk) onto the top of the cheesecake layer. 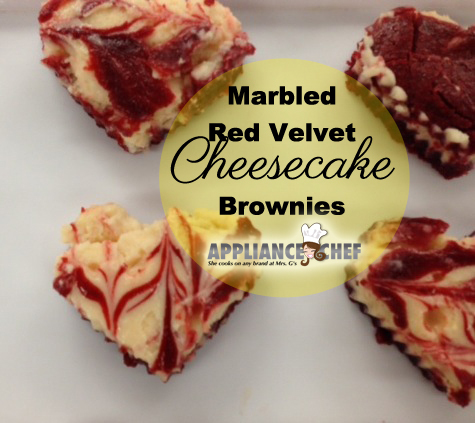 Drag the tip of a knife through the red velvet and the cheesecake layers to create swirls. 7. Bake for 30 minutes, or just until the center is set and it no longer jiggles. Let cool completely on a wire rack before cutting. 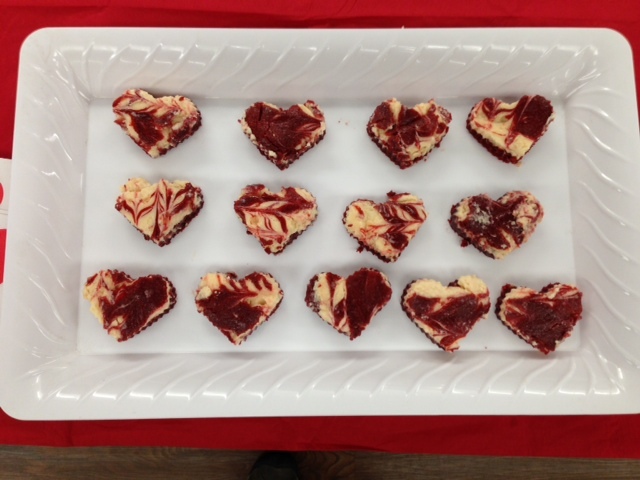 Use a medium sized heart cookie cutter to create the perfect Valentine's Day treat! 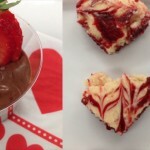 Oh these sound perfect for Valentine’s Day desserts! I think I am going to try my hand at the cheesecakes. Let me know if you do! 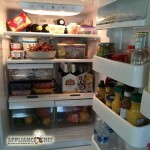 You can post to the Mrs. G’s fan page or tag me on Instagram @appliancechef. Yum Yum yum yum yum! 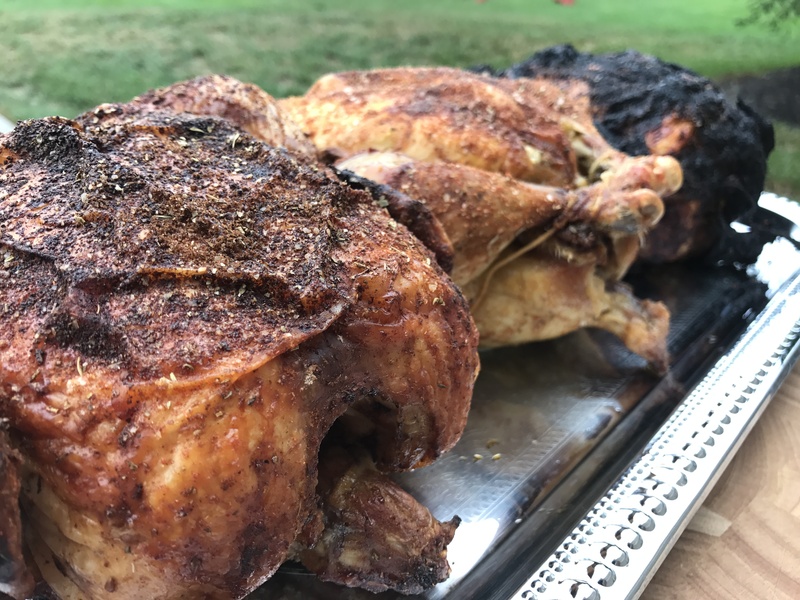 There is everything right with this recipe! Thanks Sarah!! Let me know if you make any of these too. Would love to see the results at the Mrs G fan page or tag me on Instagram @applianceChef!